Antiques challenge. 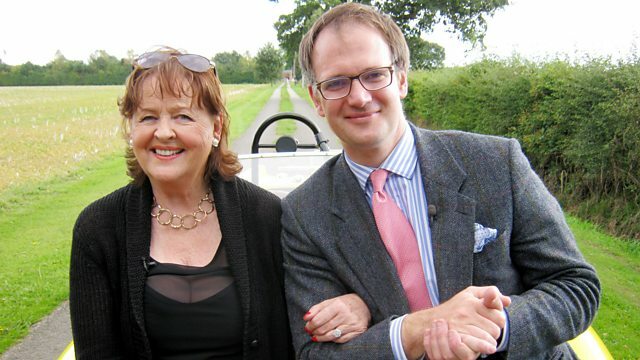 Charles Hanson and Margie Cooper's last leg starts in the village of Stickney, Lincolnshire, before they head to the final auction in Leicester. With two £200 each, a classic car, and a goal - to scour for antiques. Margie Cooper and Charles Hanson. Hello! This is the Antiques Road Trip. So far, on this road trip, Margie has seen her profits soar. putting him in the lead from day one. Both our experts set out with £200. Margie has more than doubled her money - to £425.04. But on this trip, Charles is the leader of the pack. There's only £120 between them. So, a single shrewd purchase on this leg could decide the overall winner. Do you feel, Margie, you've now got the bit between your teeth? I'm catching you up. Today might be the day. and is destined for Leicester. destined for that final Leicestershire auction. What are you going to do? Spend all your money, or what? You know, I've never been so up for it. To actually go out there with a bang. I think the way to do it is not just to play it safe. Let's both go with a bang. -Not even going to listen to you. Sounds like he's going for a big finish. located in the centre of the Lincolnshire Fens. Margie's first shop is housed in the old village butcher's. -Margie, look at this building. Margie, this is exciting. -Let me just get out! -I'm going to kiss you further round. -Oh, Margie! Another great day. -Find those treasures, Margie. OK? Good luck. Bye-bye. Hello! Ooh, this looks nice! Margie gets straight to it and dealer Alan's happy to help. -Could have been made for you. Now, I want a look at that radio? Yeah? That's in good nick, isn't it? That's in good condition, but you can't pick up any stations on it. I think it needs an aerial. -What I like about it is the case is in good condition. They were a pretty good make in their day, I suppose. and, despite its age, the mahogany case is in pretty good nick. I mean, it looks good. Oh, yeah! If someone wants to do a 1950s room. Yeah. What's the price, then, Alan? Well, if you want to take the chance, I'll do it for half of that. Right. You're done. I'm going to take a chance. A great deal. And she's not finished yet. you haven't got broken stuff in your shop, have you? Oh, dear! You'll always find an AF on it, if it is damaged. What a shame. I quite like that. Bohemian glass. Lovely cutting into the glass. Shame about that chip. But Alan has something similar in mint condition. -I quite like the Deco-like top on it. It's about 1930s, isn't it? It looks, sort of, '30s. -It's got a Deco look about it. So, is that cheap and cheerful? Yeah. I shake you with that hand, because I'll drop it. Margie's picked up two items in her first shop. and the valve radio for 15. -Bye, now. Mind how you go. Well done, Margie. Great start. to explore a very prominent local landmark. and witnessed decisive moments in global history. -I'm Steve. I'm the Associate Rector here. -The L is at the end. Botolph. That's it. I've got it now. I think I've got it. -Now, the outside is amazing. May we go indoors? -Mind the step and mind your head. prospering from the then-booming wool trade. reflected the vast wealth of local merchants. and tower were twice as quick as others of its size. St Botolph's is the largest parish church in England. What we're looking at now has barely changed. Barely changed over the centuries, yes. Wonderful. I almost feel caught in time in the Middle Ages. attracted the most influential clergyman. made him one of the most prominent ministers in the country. Those who flocked to hear him preach made use of St Botolph's unique pews. The wooden carvings over there almost glow. Are they original too? -May we take a look? Rather than separating from it, he attempted to change it from within. People travelled from far and wide to hear his lengthy puritan sermons. specifically to be part of his congregation. Some of the services went on for over five hours. So there's an ingenious device that was built. These are called our misericords. Misericordia is Latin for "act of mercy". So these are the mercy seats. and you give the impression that you are stood. -My legs are slightly bent but I can stand still. And I'm sure it was in mercy for you to be able to sit down. Quite. Cotton thrived at St Botolph's for nearly 20 years. Controversially, though, in 1630, Cotton sparked an exodus from Boston. ten percent of the town emigrated to one of the new colonies in America. settling in the town that had been named Boston. You almost feel the warmth from the actual history. and I think about the people who sat here. What was going on in the world outside, at the time. but up St Botolph's tower. 209 steps. OK. This way. I do suffer a bit from vertigo, you know. St Botolph's tower is the tallest of any parish church in the country. You're panting a bit, Steve. Keep going. We're getting there. That's the good news. And is the tallest non-cathedral tower in the world. Oh, I say. Goodness gracious me. You can see for miles, can't you? You can really see for miles. I just cannot believe that view. -You're 145 feet off the ground. I can't believe it. I feel a bit giddy up here. That's maybe a cue for me to get down. I feel a bit sick. -Do you mind if I go? -It's been a real joy. Thanks ever so much. I'm going down. -All the best. Thank you, Steve. and were the forefathers of the American Revolution. to Norfolk and King's Lynn. This harbour town is rich in heritage and maritime history. a stone's throw from the River Ouse. -It's a glorious day out there. Those are cute, aren't they? Just look at these. Margie has £405.05 left to spend and something soon catches her eye. -I love stained glass, don't you? -I do. I love it. -And with these ships on, as well. People put them into doors and make windows up of them, don't they? So, 90 for the big one, 70 for the small one. -So, what's the best on the two of those? See how they bought them and everything. Rachel shot off to call the dealer. Fingers crossed. -OK. A hundred. For the two. -A hundred for the two. Hang on. Margie loves a haggle. Brace yourselves, girls. OK. She's going to have a word. Hi, Ruth. Are you going to let me buy these, or not? Another tenner off? That's 90. Yeah, I had 80 in mind. OK. Deal done. And thank you very much. There's that the happy face. Margie's got these two Victorian stained-glass panels for half price. A nice way to end the day. Well done, Margie. Time to get some shuteye. Welcome to day two of the Road Trip. -That's how you pronounce it. and picked up three lots for auction for £100. A 1930s cut-glass cologne bottle. And a pair of Victorian stained-glass panels. Leaving her £325.04 to spend today. Charles, on the other hand, didn't spend a penny. So, he still has £545.98 to spend today. On this very land we now drive. I will make a memory today, Margie. Our experts are headed south to Hitchin. My shop awaits, and I can't wait. Look at this landscape! Are you stuck then, Charles? Don't you want to leave me? He is accident prone. Oh, there we go. I'm out of here. Good luck! -Have a good day, love. -The sun is shining again. That's right, you couldn't have chosen a better day. because he needs to buy something to take to auction. That's what the programme's about. or the jewellery - not really my thing. What I quite like is this top deck here of oriental artefacts. which as we know in the auction market, can really move. This vase, I'm sure, is Chinese. Again, what we would call Cantonese type. It's badly damaged. used the exterior as a palette for painting. but Marie is open to offers. If I said 30, what would you say? -Done, done. Sold. £30. Let's go. This Chinese Famille Rose vase is Charles' first buy on this leg. and I feel relieved now that I've bought one thing. -Thank you very much. Right, I'm and up and running. Thanks, Marie. to the British Schools Museum. of one man's mission to revolutionise education around the world. Morning, Margie, welcome to the British Schools Museum. If you'd like to come this way? In the early 19th century, Britain had become the workshop of the world. It went on to acquire an empire covering a quarter of the globe. This success was, in part, down to an illiterate workforce. Education was really the preserve only of the rich. for younger people from working class and poorer families. But one man was determined to educate all children. Joseph Lancaster, a Quaker who wanted every child to read the Bible. Lancaster came from very humble origins. He was born in Southwark in south London in 1778.
and it was becoming quite a spectacle. to children from every background. Within a short space of time, it was oversubscribed. and many didn't pay a penny. Lancaster devised a ground-breaking method of teaching. Andy, what is monitorial education? This is a monitorial schoolroom. in this case, all of the boys, were taught in one classroom. and they would take little classes of their own. and the master would look after how they were getting on. what the teacher had taught them to other six to 10-year-olds. were learning the basic three Rs, reading, writing and arithmetic. and girls for work in the new age of industrial Britain. so it was a very, very effective method. given tokens to exchange for these rewards. George Thomas Cooper who was born from very, very poor origins. and the dedication of the teachers here. an opportunity to escape from their very, very poor origins. system of universal education used around the world today. Charles is looking to add to his solitary purchase. -Is this a silver bowl here? -You mean the commemoration one? the marriage of Charles and Diana. Priced at £110 and complete with an original box and certificate. unless they're really early, can be of nominal value. but Marie has lots of sparkly things in her cabinet too. Oh, you have got some nice jewellery. The pair of cuff links, not silver gilt or white metal. They're lovely, aren't they? Aren't they beautiful? -A yellow metal and they are hallmarked gold. These early 20th-century cuff links are priced at £110. Cor! -OK, may I leave those out for a second? Charles is firing on all cylinders today. He has spotted a late 19th-century brooch priced at £160. and selected for its clarity and then carved. and the picturesque village of Barton Le Clay. Margie still has £325.04 at her disposal and she isn't hanging about. I don't really like it very much but I've just seen a very cheap ticket! Which says, French clock with birds and garniture. Garniture means the three pieces. £35! Oh, I wonder if it will ever go. because it's not running like clockwork. hallmarked cuff links and a rock crystal brooch. and then I'm going to make a couple of decisions. The oval brooch with that central stone. Victorian? It's Agate and it's inscribed. -And it's got hair in the back. "In memory of Ann Webb. Aged 43 years old." With a lock of her hair in there as well. Marie's priced this brooch at £160. Time to make some decisions, Charles. I like the cuff links because they're fabulous. Would you do them for £50? -Sold. I'll take them. Sold. How about that commemorative silver, ticketed at £110? But what's Marie's very best? the two brooches priced at £160 each. That's a £200 discount. Charles, come on. I'll take them. Thank you. £120. He's bought five items from Marie, totalling £255. The boy's on fire. -Well, I think I need to sit down now. Just having a quick whizz. ..Margie's found her favourite things in the cabinets. I bought that on my first day buying. But I made about 40, £50 profit. Yeah, a near identical brooch cost you £30.50 and it sold for 74. So buying an identical one may not be such a bad idea after all. Yeah. Yeah, it's marked. Right in the middle. Yeah, this Art Deco style 9 carat gold brooch is priced at £55. Are you going to be lucky and beat Mr Hanson? I don't think it's talking to you. He, though, is still in Hitchin. but with just over £290 burning a hole in his pocket, are there more? -In your window, I do like that scent bottle. How much is it? It is silver, isn't it? Of course it is silver. I mustn't get carried away. I bought really well so far. It needs to be about 180. I am buying with my heart. You're offering to me at 170. And I think that's worth a gamble. but this pricey 1818 scent bottle is a real gamble for the final auction. I owe you... Are you ready for this? -I know, don't say it. gold cuff links, two brooches and a silver scent bottle. 60, 80, 100 and £25. Thanks, Marie. I shall hit the high road and have a lie down. Thank you. Have you got an offer you'd like to put on that? Yeah, well, I don't to offend her. 38. So that's one phone call for Steve to make. -I was just looking at this. What you want to offer for that? -Give me a couple of minutes on that. Hello. Look who's arrived in Bedfordshire. on a Friday on the Antiques Road Trip I feel it's time to relax. He's in a good mood. Despite his earlier big spend, Charles still has £120.98. And what's he found here? Careful, Charles. Not in a china shop. Oh, dear. Stop showing off. There we go. I'm up. Stilts, with your accident-prone record? This is not a good idea, Charles. Will you get off them? I've had a very tiring morning. No, don't crash into those glass cabinets. It's nearly closing time. Margie's just a few minutes for one last look. I've had a great look around and I'm quite happy. I feel my buying time is done. And there's one thing for it. Cup of tea. No rest for Margie yet, though, and Steve's back with news. -You offered £20 on that one? -I'm having a punt, really. -but we'll take £20 off you. -And we accept the offer of £38. -Thank you very much, Steve. Do you want a cup of tea? I don't mind if I do. Thank you. and clock garniture all for £58. To go with her last two buys, Margie has three other lots. and a 1930s cologne bottle. All that cost her £158. While Charles spent a whopping £425 for six lots. a Victorian mourning brooch and one big spend on a silver scent bottle. Wow. What's he up to now? Oh, delicious, Charles. Pity you've dropped it. what do they make of each other's final lots? I saw that clock garniture in the shop. It's what you call kitsch. And in terms of market demand today, well, it needs to go some. So Charles has really spent his money. I didn't think he was going to do that. And he's bought a silver spiral scent bottle. Well, I still think he's got a clear 200 to get a profit on that. Margie, I told you I would spend wisely, go big, and I have done. Good luck and roll on the auction. It's been an eventful final leg for our two experts. and the big auction showdown. What fun. But there's time to take in the scenery. -Margie, let's breathe in that Leicester air. -Isn't it wonderful? The sky's blue. -Nearly time for the last auction together. -It is quite sad, isn't it? I've had a really good time. because hopefully you'll say, "Charles, I impressed you." "I'm a glamour girl and, Charles, you did it for me." and it's here our winner will be anointed. Gildings Auctioneers. This is it. there's an easier way of getting out of this car. -Yeah. On the count of three, it's all over. Auctioneer John Gilding will be on the podium today. What does he make of Charles and Margie's choices? I quite like those little stained glass panels. And I think sort of put an estimate of 30 to £40. if they don't make a bit more than that, to be honest. a bit depressing, so we never know on that one. They're crossed and the auction's about to start. Time for Charles and Margie to make themselves comfortable. These two nice comfy chairs. Hold tight. First up is Charles' vase. A little knocked about, but bought at a knock-down price. -This was a wonderful piece, of course. -I'm going to start the bidding. £20. I bid 20. 25. 28. I bid 28. Bid 30. First profit of the day gets Charles going. To the young collector, it's a lovely vase, it's completely right. It's just broken. But over years, if you're 140 years old, how would you? Steady. Now Margie's turn. Her two stained glass panels are next. 5. 50. 5. Still seated at 55. I thought they'd be more. Seated then at £55. All done? That is a shame. First loss of the day and bad luck, Margie. I truly felt they were going to make a £120 bluff. Will you be quiet from now on? Charles' Victorian mourning brooch is next. -And I think it's a lovely object. -And you dated it, 1869. And where were you in that year 1869? Bidding starts with me at £45. Hey, pay attention, you two! One man's profit or gain. -And whatever it makes is history. -On the net at 100. All done? Selling to the net. £110. You joking. What did it make? Did we miss the mourning brooch? -There you go. Well done. Yeah, well done. A £50 profit. Up next is Margie's valve radio. -15 in the room. 18. 20 in the room. 20. 22. And 5. 28. 30. Oh, come on. Let's recoup some of my losses. 5. 38. All out in the room? I can't grumble at that. More than doubled your money. Margie, well done. -Fair enough, that, wasn't it? Charles' second brooch now. The Essex rock crystal. I think this is going to do really well. -Anything that says, "rock crystal." -And bidding starts with me at £20. -Oh, no. It's got to move. 30. 5. 40. 5. 50. It's in the room at £110. All done? Sold at 110. Another brooch, another £50. Well done, Charles. Margie's cologne bottle is next to go under the gavel. £20. Lovely piece, this. At 22. -Standing in the middle at 32. 35. Standing at £38. Away at 38. Ah, the sweet smell of success. Well done, Margie. Charles spent big on this lot. It was a gamble. Will the silver scent bottle cost him dear? Lovely little piece, this. At £80. £160. All done? Selling it at 160. Someone's walked away with a lovely piece of silver at a great price. Charles has suffered his first loss of the day. But it's only a small one. Not too much gone on that. She sold one just like this earlier in the week and made £40 profit. Can this one do the same? -It's done all right, again. -£70. Are we all done? 5. 80. Margie Cooper, I admire you. It was a great spot, Margie. And it's earned you another profit. floating ready for the Cooper clutch? Charles bought at a discounted price. -And we've got a bid here, then, of £55. -That's good. Cost me 50. Another profit, Charles. Good stuff. -I'm happy. Margie, I'm happy. It's time for Margie's early 20th century clock garniture now. And £45 open to bidding. Do I see 50 anywhere? 50 bid. In the room at 50. The internet is out at £50. I thought this would make a lot more than this. A good profit, but is it good enough to win? Charles' cuff links. Very nice. These are really nice, indeed. 75. 85 bid. 160. Still on the net at 160. At 170. Still with the net, but it's up to you. Bid quickly if you need them. At £170. Give us a kiss. That's fine. Give us a kiss. to end today's auction and this Road Trip. -Where do you want it? Margie started this final leg with £425.04. After paying auction house fees, she's made a profit today of £68.32. Ending the week with an outstanding total of £493.36. After fees he made a profit of £114.56. Winning today's auction and this Road Trip with an exceptional £660.54. Remember, all profits from the series go to Children In Need. You must be happy. You done well. I'm happy, but that song is, we'll meet again. I hope so, Margie. Well, at least I've achieved something. Getting in this car is so much easier. -Shall I drive you one more time? One last time. Don't be slippy. Sorry. I'm not in gear. I don't know. Something which came off the car. -I'm no mechanic, but listen. I'm going to break it. I want to shoot Margie down. Most of all they've gained some memories to cherish. Get out of here! Wonderful. Thank you very much. ..takes on playful Philip Serrell. Charles Hanson and Margie Cooper have been clocking up the miles around England in an Elva Courier on their road trip. Their last leg starts in the village of Stickney, Lincolnshire, and heads to that final auction in Leicester.